Hydrogen Peroxide ($.83 at Walmart): This is used as a teeth whitener! I've been using this for about 8 years (after my grandparents shared this secret with me from their dentist). People are always asking me how I get my teeth so white and this is the only whitener I ever use. Witch Hazel ($.83 at Walmart): This is used as an astringent! This really helps my face to stay clear of any blemishes. It also helps get off any makeup your face wash left behind! Directions: Pour onto cotton ball and rub over face after washing with your daily face wash. I usually do this morning and night! 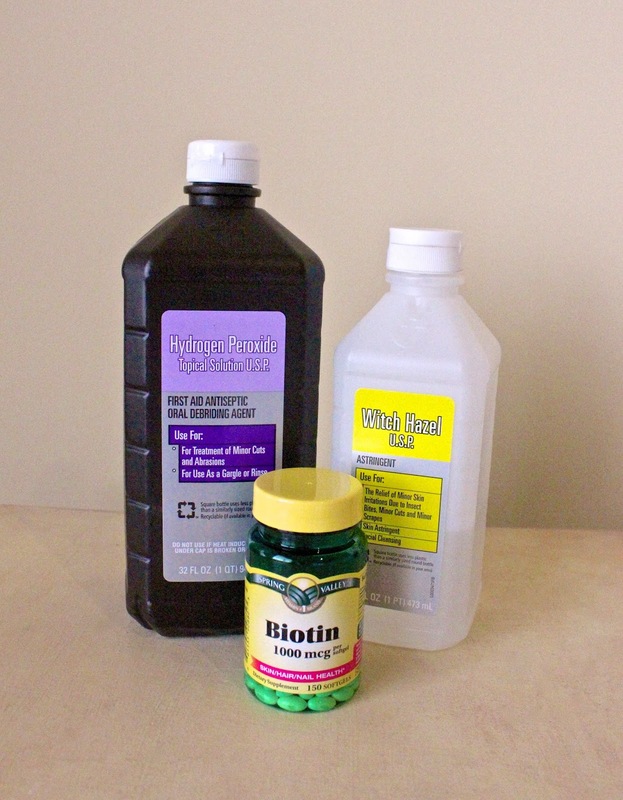 Biotin (1000 mcg, $2.94 at Walmart): This is for healthy hair, skin, and nails! About three years ago, I was at the hair salon talking to the hairstylist about how I was trying to get my hair healthy after I went through a regretful season of bleaching it. My hair was pretty fried and didn't grow very fast at all. The lady told me to start taking Biotin. I immediately started taking it and it wasn't long before I began to see amazing results! Today, my hair is as healthy as it's ever been. I don't have split ends and my hair has been growing so fast! I also noticed a big difference in my nails as well. They were always kind of frail before and now they're strong and grow fast too! Directions: Simple. Take one everyday!